Even though the Whole World is Burning, premiering Sunday at the Maui Film Festival, begins unexpectedly in a valley of exotic palms. This is the biography of W. S. Merwin, Poet Laureate and erudite man of conscience. His has been a unique life, and beginning the bio of a poet in the valley he has restored may be the best place to start. Merwin nurtures an ecosystem in a small corner of Maui, reclaimed from a certified wasteland. That's his small-scale work. On the global level, Merwin has the audacity to stimulate thought, to render dire situations of humanitarian and ecological devastation beautiful via his stunning eloquence. President Obama declared Merwin poet laureate of the US in 2010-2011, following a long career writing as conscience of the country. He garnered two Pulitzer prizes, one of which he declined over objections to the Vietnam War. He collected a long list of awards much as he collects rare palm trees: on his own terms. 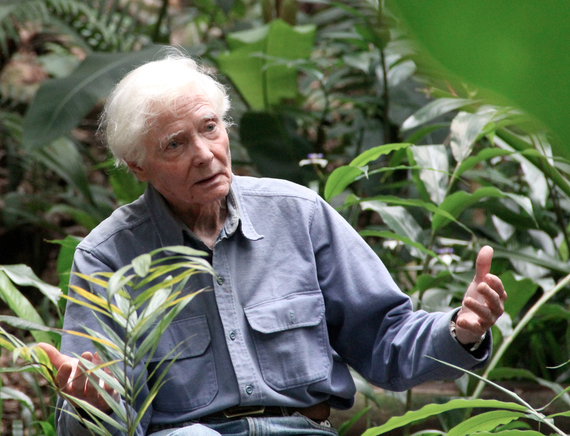 Merwin is approaching 87, and his fantastic life screamed to become a documentary film. Merwin made Maui his home in 1975. Filmmaker Stefan Schaefer transplanted more recently and met the Merwins socially. Upon finding out his profession, Merwin and his wife Paula asked Schaefer to take a look at proposals from companies clamoring to make the bio pic. Schaefer gave them his best advice, but about six months later, that deals had crumbled and the Merwins asked Schaefer if he would be willing to make the film himself. Documentaries are tough, from fundraising to finish, but Schaefer took on the project, and the premier Sunday marks a milestone of bringing the first version of the film to viewers. "We did a Kickstarter and an Indiegogo," Schaefer explains, "and I like it in terms of building your potential audience and getting a bunch of 'evangelists' behind your project, but it takes a lot of effort and time." Over the three years of production so far, Schaefer and his team have invested an incredible amount of time, both on Maui and traveling with Merwin, retracing his life's steps. The arduous process has had its own effects on the eventual film and on the filmmakers. "Everyone involved in this certainly wasn't doing it for the paycheck," Schaefer relates. "For example, Andy [Rice], who was my cinematographer on most of it and also my editor, we went to France and New Mexico, we spent a ton of time with William and Paula out in Haiku. He was deeply invested in the content and also just the friendships that developed." 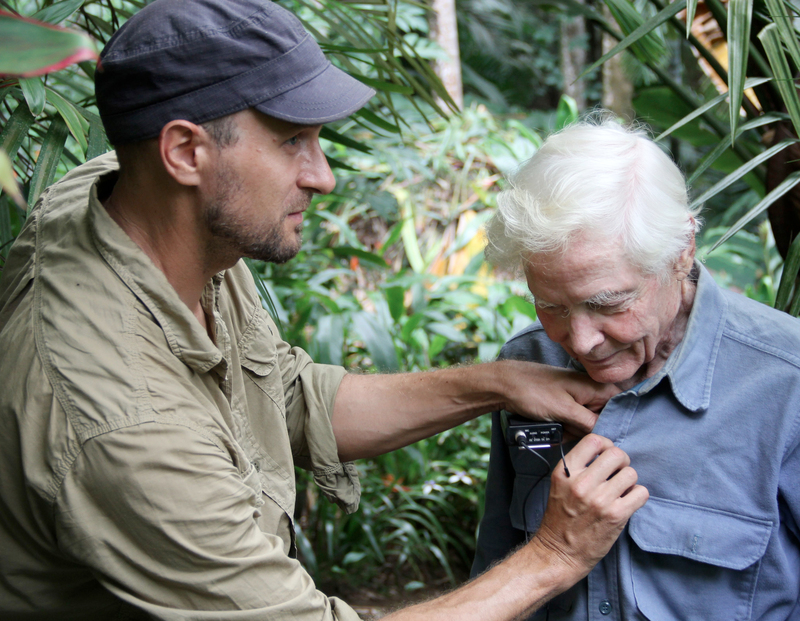 The affection that grew shows in the lovingly crafted cinematography, in the candid moments with Merwin, and in the respect with which Merwin is portrayed. Bios of great people easily descend into pandering, but the reverence here shows not in sentimentality, but in the crafting of a well-paced journey into Merwin's world. Interviews with Merwin, his wife, and friends unfold amid superb cinematography, scenes of Hawai'i interspersed with the Dordogne valley region of France, where Merwin spent his early adulthood, and to which he returns in the film. "Partly because it's poetry, I think, the pacing sort of revealed itself to us," says Schaefer. "What made it easier is that you have Hawai'i and you have the fact that he's been planting these trees, and that provides a motif above and beyond his acclaim as a poet." Merwin gradually rebuilt the ecosystem of his valley tree by tree, with table scraps painstakingly dug into the soil and an encyclopedic understanding of horticulture that he developed along the way. Merwin's way of learning is not fast, but it's deep. The Folding Cliffs took years to write, Ko'olau's story unfolding in an epic poem of Homeric scale. The valley has taken him decades. Those labors reveal his commitment to nature and humanity, even if he can personally save only a small part, word by word, plant by plant. The film reveals Merwin in these glimpses: as with Kalalau valley, you can never see it all at once. "He said 'I'm not going to talk about Buddhism and I'm not going to talk about my writing process,' and on top of that, he's just a deeply private person," Schaefer explains. "It's not like it was all access and we could just go and shoot what we wanted. So that put some creative parameters on what the film is." At this point, the film is certainly one of the best to come out of Hawai'i in years. The story unfolds naturally, giving a thoughtful view of the man that reaches behind the externals. Schaefer and his team have crafted a thoroughly professional piece to present to the world, which brings us to the next stage of the story: where does it go now? "It'll be screening at the Sun Valley Writers Conference, which [Merwin] was a part of for 20 years, in late July," Schaefer says. "There'll be a 60 minute version for television, and we have this 85 minute cut [the version premiering Sunday]." In the process of filming, Schaefer collected close to 200 hours of content, which will be available via the Merwin Conservancy. Other groups including a non-profit called The Canary Project have expressed desire to screen the film, and Schafer expects other audiences interested in Buddhism, poetry, and environmentalism to seek the film out. Additionally, Schaefer is negotiating distribution internationally. The work goes on. "To me, he's just a really profoundly inspiring artist who's lived his life on his own terms," Schaefer says, explaining why it's worth all the effort. "When I spend time with him or look at his work, he's made bold choices and he's been true to himself, and that has worked for him. There are lessons to be learned from this man who has lived in many different contexts with many, many different people, and he's stuck to his guns and did it his way, and has treated the world well and treated the people around him pretty well. His poetry moves me, and his daily practice I find pretty inspiring." Even Though The Whole World Is Burning (Feature Film Documentary) premiers Sun, Jun 8th 5:00pm at the MACC McCoy Theater.